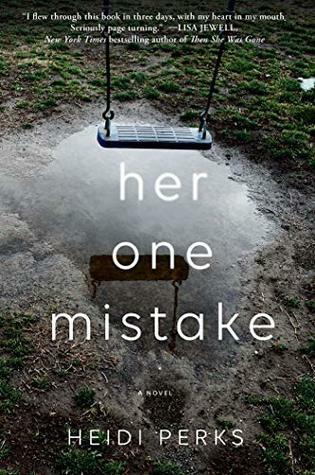 Her One Mistake by Heidi Perks is a gripping thriller that covers every parents worse nightmare, a child gone in the blink of an eye. The author has given this a bit of a twist though with it being a friend taking care of the little girl when she goes missing. Harriet had never been separated from her four year old daughter Alice since she had been born. Other mothers use babysitters, friends or family quite often to get even a small break but Harriet was a stay at home mother who hadn’t trusted anyone with her precious daughter until now. Charlotte is Harriet’s best friend and about as opposite as can be. With three children of her own Charlotte volunteers to take Alice with them to the school fair so Harriet can take a class that afternoon. With four kids in tow Charlotte heads to the fair where the children begin to play but when her own children return from a ride without Alice Charlotte is devastated when there is no sign of the child. Her One Mistake is one of those books that really was thought provoking. We are a society of placing blame on victims and as much as anyone disagrees with Charlotte’s actions in the beginning of this she is still a victim having to live with what happened. And then there’s Harriet who your heart can’t help but break for as the emotional side of the book begins to stand out. But of course as with any good thriller there are plenty of twists and turns to keep a reader guessing until the last page. Definitely one that kept me on the edge of my seat and would recommend. AWESOME review Carrie! I have this and now I’m really psyched to read it! Wow, wonderful review Carrie. Sounds very thought provoking. Definitely not a position I would ever want to be in. Oh I know, I can’t imagine how it would feel to lose someone else’s child. The guilt would be gut wrenching.